Are Ready-Made Lessons an Insult to Teachers? I’ve been following the online conversation about the need for quality materials to help teachers implement the Common Core Standards. I see a paradox brewing. Have you noticed it? I honor Nancy’s experience, but not all of her conclusions. As a teacher, creating curriculum was a passion for me. I created huge thematic units integrating all the subjects into specific topics of study, and my lessons were wildly successful. But I believe Nancy and I are part of a slim minority of teachers. Whether or not you agree, it’s an important conversation. School leaders need to pay attention to it, now more than ever. Why? Because teachers are on the front line of what some are calling a tectonic shift in American education. 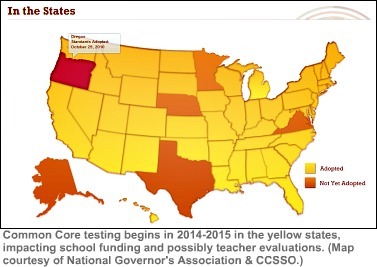 It’s called the Common Core Standards, and it’s impacting 46 states, two territories, and the District of Columbia. In two short years, students will be tested on the new standards, which will require much more rigorous instruction. School funding will be determined partly by Common Core test scores. Teacher evaluations may be, too. Let’s help teachers get this right. As decision makers determine how best to support teachers in revamping instruction, we need to hear all their voices. So far, there’s one voice I’ve heard very little from in this debate. Some might even argue that this voice has a special place in the conversation about support for Common Core teaching, because it belongs to those who will lay the foundation for Common Core success. It’s the voice of elementary teachers. Here’s what I’ve noticed. Those expressing upset about ready-made lesson plans are nearly all secondary teachers. They are subject-area specialists. They teach middle school and high school students, and generally live and breathe math, science, social studies, or English – whatever it is they teach. To the contrary, elementary teachers specialize in no particular subject. They specialize in children. Elementary teachers initiate our youngest learners into formal education, teaching not only handwriting, reading, arithmetic, social studies, and science, but also the habits and behaviors that encourage success in school. The training and personal qualities that make an outstanding kindergarten or third-grade teacher are different from those that make an outstanding secondary teacher. The biggest difference is subject-area specialization. Unlike their secondary school counterparts, elementary teachers are not asked to focus on the new Common Core Standards in math or English/language arts standards. They must find the time and gather the resources to do both. They’re trying to refigure their math lessons while grappling with demanding new reading standards, not to mention new writing standards that introduce research writing in kindergarten – and that’s just for starters. Did you see the Washington Post article about rookie teacher Bruce Friedrich, who was named his school’s outstanding teacher in his second year in the classroom? In spite of this, Friedrich expressed intense frustration that his district didn’t try to help him avoid beginner’s mistakes by providing lesson plans. “There were no exemplary lesson plans, no recommended class activities, nothing,” he lamented. Friedrich was a novice, but in my experience, there’s one subject for which even most veteran elementary teachers welcome ready-made lessons. That subject is writing. Writing is one of the most difficult subjects for elementary educators to teach. As writer Anne Morrow Lindbergh said, “Writing is thinking.” It is not a concrete operation like addition, subtraction, multiplication, or division. It is more complex than learning phonics. Writing well requires students to combine many skills effectively. Because of this, even though most teachers can recognize “good” writing, many feel poorly equipped to get their students there. To be sure, there are elementary teachers who enjoy writing, gravitate to it out of personal interest, invest their time and energy absorbing best practices, and create thriving communities of writers in their classrooms. We should all be celebrating them! But it’s a mistake to think that everyone is going to follow this path. We shouldn’t let these “naturals,” along with the voices of proud, specialized secondary teachers, silence the majority. 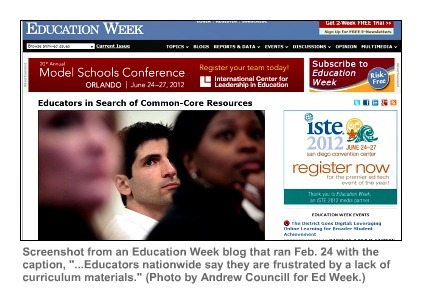 The Common Core raises the stakes for writing instruction, teachers are asking for help, and there’s no shame in it. Let’s be clear about it: there are thousands of highly accomplished teachers who welcome ready-made writing lessons. Other research shows that the writer’s workshop model is the most effective method in elementary classrooms. How, then, do we support large numbers of teachers with this technique, if PD isn’t enough? What will help the hundreds of thousands of teachers seeking to implement rigorous new writing standards? When we look carefully at this, guess what, folks? Ready-made writing lessons make a lot of sense. Good writing lessons incorporate best practices that are supported by research, and they do this in a format that works well for teachers. Besides incorporating writing workshop, what might this entail? There are entire books on this topic, and this isn’t the place for exhaustive answers, but I can offer highlights. Research supports the use of “anchor texts” (including student samples) to motivate children and build skills. 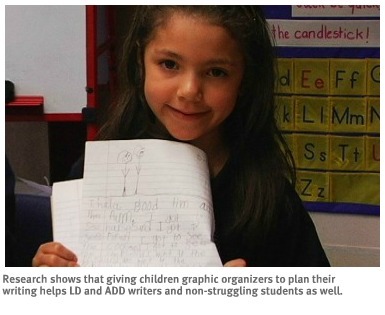 It also supports giving children graphic organizers to plan their writing. These techniques have been conclusively shown to have positive impacts for LD and ADD writers and non-struggling writers as well. We also know from studies that students need plenty of reinforcement, or they will abandon the writing techniques they learn within a month! This points to the need for a writing program that is carried out consistently throughout the year and across the grades. This is not the same as what is offered in most basal language-arts programs. Many educators have gone wrong by judging ready-made writing lessons by equating them with the heavily scripted lessons that are typical of these basals – lessons so prescriptive that they’ve embittered teachers and give writing lessons a bad name. However, not all ready-made writing lessons are created equal. 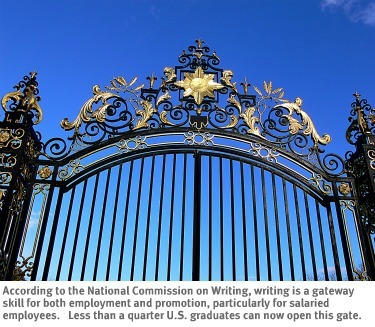 “Writing is a gateway for employment and promotion, especially in salaried positions.” This comes from a report by National Commission on Writing, which­­­­­­ concluded that students who don’t learn to write well are at a considerable disadvantage when they leave school. Yet, on the last national measure of writing skills (the National Assessment of Educational Progress, 2002), only 28 percent of fourth graders demonstrated proficiency, and less than a quarter of twelfth graders met the benchmark. Webinars, PD, and curriculum maps from basal publishers aren’t going to do the job when it comes to giving students Common Core writing skills. It couldn’t be clearer. Common Core writing lessons are a common-sense solution. Principals, if you’d like to get the scoop on success with Common Core writing, look for WriteSteps founder and CEO, Suzanne Klein, at the National Association of Elementary School Principals conference in Seattle later this month. Suzanne’s presentation is scheduled on Saturday, March 24 in Room 3a-3b. Researchers Steve Graham and Michael Hebert of Vanderbilt University in Nashville, Tenn., systematically reviewed 95 studies. They found that all of the studies indicated that writing-skills lessons and the amount students wrote strengthened their reading skills. A whopping 94 percent of the studies showed that writing about material increased students’ comprehension of that content. The effects were stronger when they were specifically taught how to write. “Writing and reading decrease our sense of isolation.